May the 4th and All that Jazz - Nekaro & Co.
Our wonderful neighbor came by on Friday evening and used a huge tiller to till up the new garden spot. Bright and early Saturday morning, we headed to the local farm supply store for starter plants and seeds. 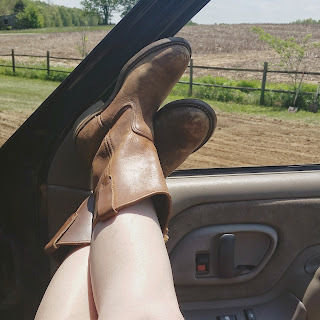 I broke out my 20 year old boots. Hoein' ain't easy. *insert pimp joke* We spent more time than we should have removing clods of grass. Eventually we got it done. Green beans, corn, carrots, broccoli, peppers, tomatoes, and basil (because I LOVE PESTO). I forgot onions, lettuce, and cabbage. I blame it on my overexcitement of finally having a real garden after years of trying different container ideas. Sunday, I remembered that I am 36 years old. Bending over repeatedly planting seeds and digging in the dirt for hours in the 80F degree heat is not as fun the day after doing it. Please let there be fruit (and veggies) from my efforts. May the Force be with me. I hope yours turns out perfectly! Thanks! I hope so too! We've tried so many times and I'm looking forward to having a garden that actually produces something!